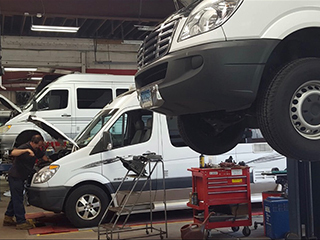 At Cusson Automotive in South Windsor, CT, we are a full-service repair facility for sprinter vans, including Freightliner Sprinter, Dodge Sprinter, Mercedes Sprinter, and more. With the latest available test equipment and software, our ASE certified technicians can handle your Sprinter van needs. Our shop is equipped to help with regular service, factory maintenance, and major repairs. At our South Windsor Sprinter repair shop, we have the latest automotive technology to properly repair and maintain your van. Cusson Automotive has remained the trusted choice for van repairs and service in the area since 1993 for business and fleet. If your company has a fleet of Sprinter vans, you can be sure that our shop will help you better maintain your vans and make sure that any repairs are taken care of quickly to keep your business vehicles on the road. We will help minimize your fleet downtime and increase the overall reliability of your vans. We service all aspects of sprinter vans, including brake repair, oil services, fuel injector replacement, drivetrain repairs, shocks and struts, tires, engine repair, factory recommended maintenance and much more. We are the only knowledgeable, experienced and convenient location in the area for all of your sprinter repair needs, including emergency breakdown service and 24-hour towing. Cusson Automotive is your dealership alternative for sprinter repairs and services for Freightliner Sprinter, Dodge Sprinter, and Mercedes Sprinter vans. We have amazing warranties available for parts and labor including NAPA AutoCare and Jasper engines. If you have any questions about your sprinter van, don’t hesitate to give us a call today or stop by our shop for expert advice and service!